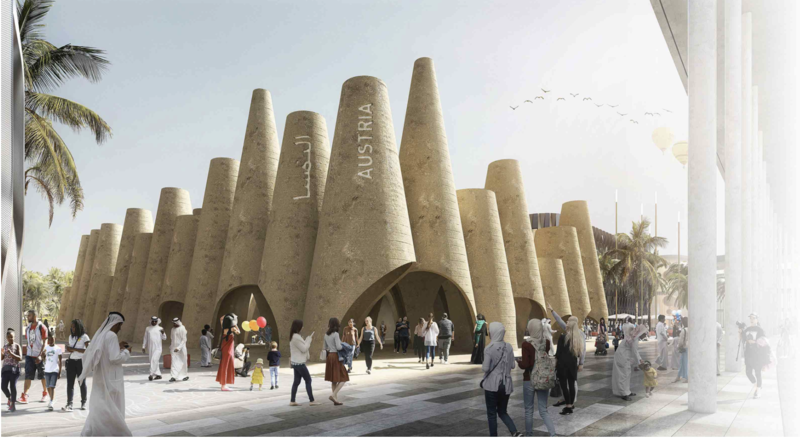 Austria will use a 9,000-year-old building material made of sand, silt and clay to create its pavilion for Expo 2020 Dubai, showcasing an age-old technique in sustainable construction. The Austria Pavilion’s exterior will comprise about 60 interlaced cones of differing heights created from loam, a compostable soil that has been used in construction for millennia. The positioning of the cones will allow for natural ventilation, reducing the temperature by up to 10 degrees Celsius and eliminating the need for mechanical air conditioning – representing intelligent resource-efficient architecture that is as robust as it is smart. Inside, an interactive exhibition will illustrate the theme ‘Every good idea begins with the right question’, through the stories of Austrian thought-leaders and change-makers. An Innovation Lab will stage a series of temporary exhibitions, workshops and installations. Located in Expo 2020 Dubai’s Opportunity Thematic District, the pavilion will also offer a haven for relaxation and contemplation. Visitors will be able to unwind and share ideas while enjoying Austrian delicacies at the Viennese coffee house – an institution recognised by UNESCO as an ‘intangible cultural heritage’ – or step into the shaded courtyard’s tranquil surrounds. The Austria Pavilion represents the country’s ambition to use Expo 2020 Dubai as an opportunity to delve into its past in order to create a fresh dialogue for solving modern-day challenges. With striking visuals and thought-provoking ideas, the pavilion will underline the nation’s status as a multifaceted powerhouse of innovation. Expo 2020 Dubai expects 180 participating countries, with more than 170 already confirming. More will reveal their pavilion designs in the coming months, as the first World Expo in the Middle East, Africa and South Asia (MEASA) region progresses towards its Two Years to Go milestone, on 20 October, 2018.